Keyword research and SEO? It ain't as easy as it used to be, that's for sure. It's so funny to think that eight years ago, SEO used to be so easy. But it’s so much harder now! You used to be able to put up a blog post, stuff it with keywords and then you’d be like, hey I’m ranking number one and I haven’t even done anything. It’s not that simple anymore. That will not work today. 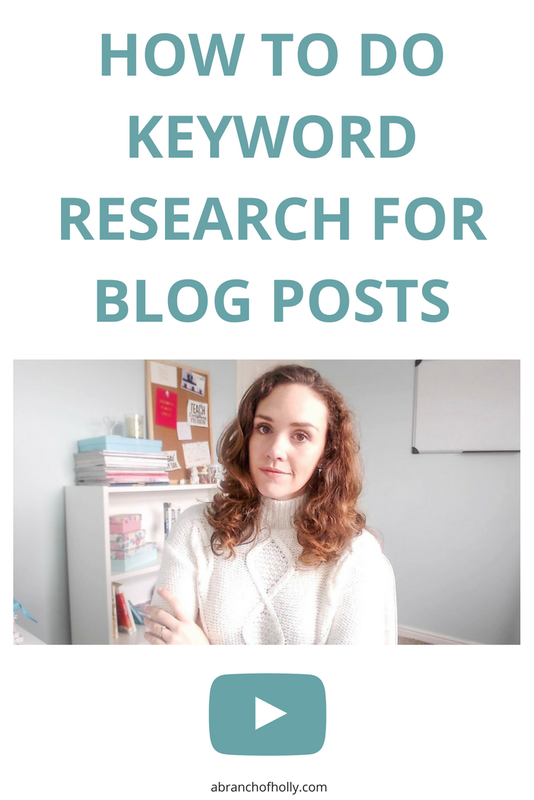 So I wanted to take you through some ways that you can do keyword research for your blog posts that WILL work and that will help your blog posts rank in search engines. You are not going have a chance of ranking unless you’re consistently trying to rank for keywords in a specific industry. You might get there eventually if you’re just using random keywords. But SEO takes time. It’s going to take six months to start getting traction from SEO and 12 months to start to see a difference in your traffic. Take my website for instance. This time last year I was getting around 30% of my overall traffic from search engines which was about 2,000 users.. Right now, I’m getting 82% of my traffic from search engines and that’s about 52,000 users. But it’s taken SO long for me to get there because I was picking big keyword terms to rank for. Don’t do what I did. If you niche down and focus on long-tail keywords, you’re going to have a much better chance of ranking faster. Take my industry for instance, digital marketing. The online world is changing so much that I need to make sure I’m keeping up to date with everything. So when Instagram makes new changes to their algorithm, I need to talk about that and tell my audience about it. Why not go after interesting topics that people are actually talking about right now? It could be new fashion trends or new beauty products that are coming out. If you know something people are talking about or any new products that are coming out, write a blog post on it! And if you try and rank for new things that people are searching for, it’s even better. Not a lot of people are trying to rank for these terms and they’re not that competitive either. So there’s a good chance you’d rank high in a really short space of time. Now I want to move onto a tool that you can use and that’s Keyword Planner. They’ll type in keywords like: "cheap wedding dresses" or "vintage wedding dresses" or "long sleeved wedding dresses." Google’s Keyword Planner will show you different suggestions of your main keyword, how competitive they are and how much search volume they get. Next I want you to look at using Quora. If you type in keywords related to your niche, you’re going to see the most popular questions that people are asking..
What’s great about Quora is that people are actually asking these questions. And you’ll be like, oh man I could totally answer that in a blog post! You can also look at whether they’ve got a lot of responses and if they have, that means a lot of people are curious about this. And if you create those answers on your blog that are more thorough and detailed, you’re likely to rank higher and people will come to you to find out what you have to say. Back in the day, you’d just be able to stuff your post with keywords and Google would rank you for that. These days it’s about focusing on your readers and what they’re actually searching for. So if you’re primarily a beauty blogger then you want to have a blog that is all about beauty. Or you want to have a website purely about digital marketing and building an online presence like mine. So while I could rank for words like blogging or social media, I actually get much more results from the long -ail keywords that people are searching for like, how to use polls in Instagram Stories. The way you get traffic this way is by creating content on specific topics that people are searching for. So it’s not writing a blog post on “how to cook vegan.” It’s writing a blog post on "how to cook vegan for beginners." You see how much more specific that is? Then you create other blog posts on "how to cook to cook vegan curry" or "how to cook vegan soup." If you do this and write detailed blog posts, you’re going to dominate the vegan industry. Because by being that specific, anyone who is interested in how to cook vegan, they’re gonna be landing on your website. Google doesn’t just try to rank the most popular website at the top. They’re trying to rank the most thorough websites that are relevant to what people are searching for. It’s not about trying to create loads of pages. It’s about creating pages that are super detailed and high in quality. That’s when you’ll start to get traffic. So that is how to do keyword research for your blog posts. Was there a part of this that you didn’t understand or that you weren’t sure of? Let me know in the comments. Remember to be the boss of your keyword research so you can get one step closer to a breakthrough.